Ruperto Jay Matamoros joined the Free Studio for Painters and Sculptors, created by Eduardo Abela, in 1937. In the first and only exhibition presented by this workshop, Matamoros exhibited his painting Escena ganadera (Livestock Scene), for which he received an honorable mention. Since the 1940s, has been recognized as one of the top exponents of popular painting in Cuba. 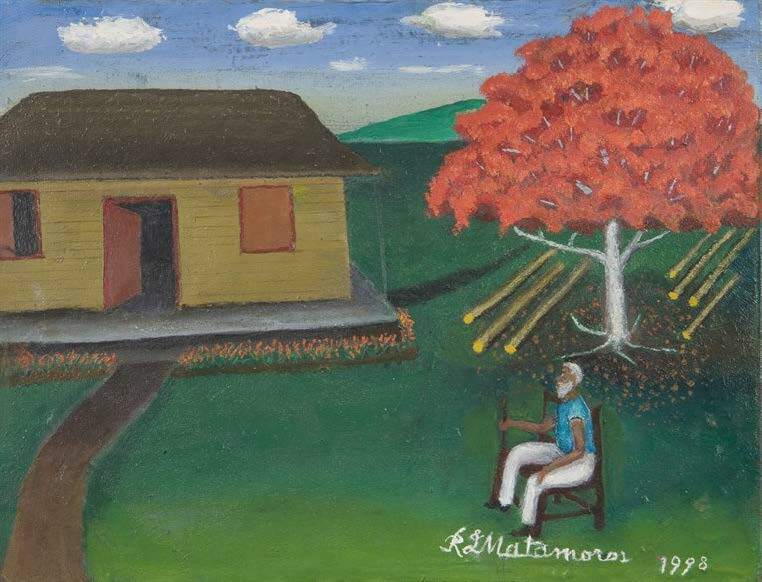 For more than sixty years he devoted himself to painting, particularly countryside landscapes that show his unquestionably deep roots in Cuban soil. He also depicted other themes such as urban and coastal landscapes, historical scenes and portraits. Staring in 1959 his work began to earn the acknowledgement it deserved, both in national exhibitions and abroad. He thus became an emblematic figure of Cuban popular painting. His works are part of important collections in Russia, Canada, the United Kingdom, Bulgaria, Italy, France, the United States, Switzerland, Poland and Venezuela, as well as in the National Museum of Fine Arts in Havana. In 2000 he received the National Visual Art Award, granted by the Cuban Ministry Of Culture for his lifetime achievements. Sus siete maderos (His Seven Timbers), 1998. Oil on pressed canvas board. Object: 12 x 15 1/2 in. Untitled, 1999. Oil on pressed canvas board. Image: 6 3/4 x 10 1/2 in. Framed: 8 x 11 3/4 in.